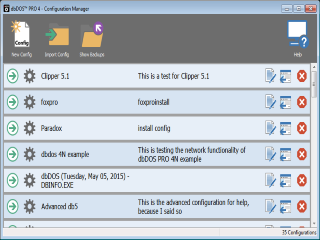 FoxPro 4 DOS | The home for all things FoxPro for DOS related! 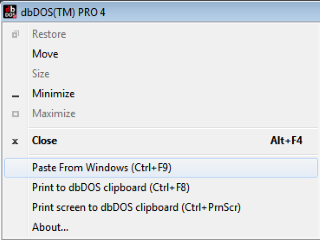 Simply the fastest way to run FoxPro for DOS on a Windows 64-bit operating system. 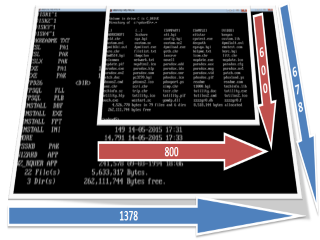 In the old DOS based programs, there was the ability to print the screen contents to a printer. Pressing the Ctrl-PrnScr button or clicking the dbDOS™ PRO 6’s System menu option that will take a screen shot of the current screen and send it to a printer or clipboard for further processing. dbDOS™ PRO 6 comes with everything you need; the ability to change screen resolutions, printers, and different formats all at one low price. No need for any other software, just dbDOS™ PRO 6 and the DOS based software you want to run and use. 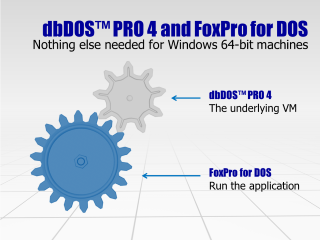 All you need is dbDOS™ PRO 6 and a copy of FoxPro for DOS and you are ready to go!